Many moons, and carrot sticks ago, Pricilla the spokesgoat for Happy Goats soap, sent me an email regarding her humble abode that she was building. Now this wasn’t just any abode, it was a yurt. 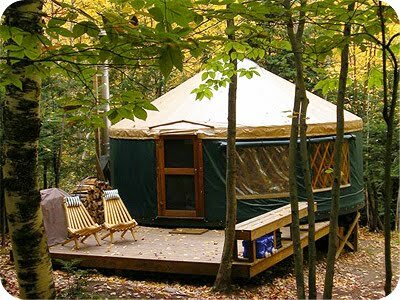 If you are unfamiliar with this term, a yurt is essentially a round structure, with a wood lattice frame, tradtionally used by nomads because they are portable. But honestly, I can’t see Pricilla being a nomad. She is a pampered goat with too many demands to speak of, and she has way too much stuff to be moving all the time. Because Pricilla is the spokesgoat of Happy Goats soap, she is quite full of herself, and has the needs of a glorified, overpaid, CEO. 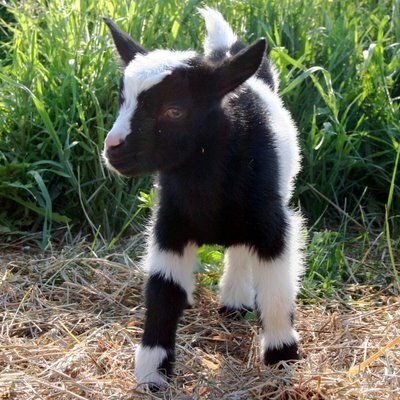 (Probably because she got the position over Abigail the other goat, and Pricilla doesn’t like her much.) But honestly, between you, me and the fencepost, I think Pricilla’s attitude is the publicist’s fault. Yes, I am a bit bitter. Although I find Pricilla very interesting, it was Harry that had my heart, and the publicist’s sent him off to the nether regions, I mean a new farm with lots of room to roam and play. Despite the publicity that followed this heartwarming farewell, the publicist and Pricilla had tricks up there sleeve hooves, and I think a little insider trading was going on. But my feelings on this matter remain the same and is a whole other story that we won’t discuss. HUMPH! Ok where were we? Oh yes, Pricilla the spokesgoat. 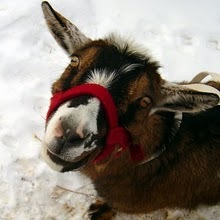 Pricilla, the demanding CEO of Happy Goat Soaps, wanted me to help her design and plan her yurt. There were many, many things on her list of needs, but her mouth was so full of hay I could barely understand her. I was able to determine that she loved color, and she loved big sofas. I was however, skeptical of the big sofa. She has a tendency to knaw on upholstery, so I made a note to keep it small. After all we are designing a yurt, not the Taj Mahal Pricilla! So what exactly is the interior of a yurt like? 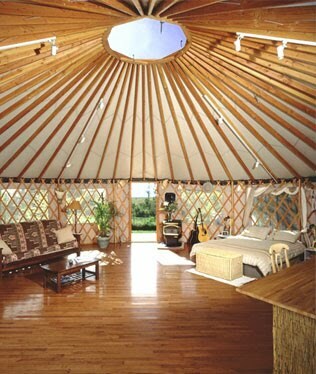 Yurts are always round, and have interior framework exposed. This framework can be hidden with canvas or other materials but most people leave it exposed. 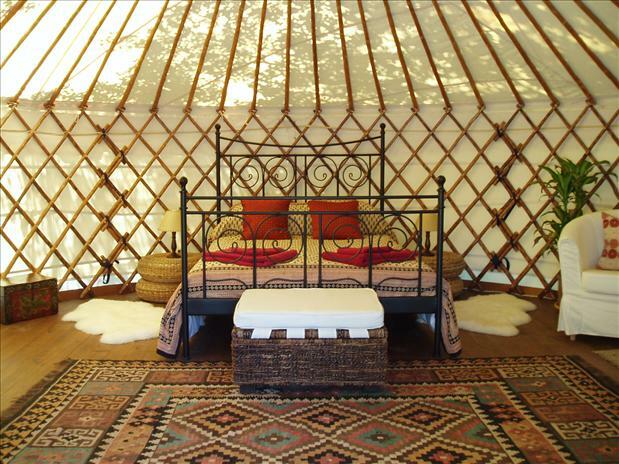 Yurts vary in sizes and can be as small as 12′ in diameter or as large as 40′ in diameter. 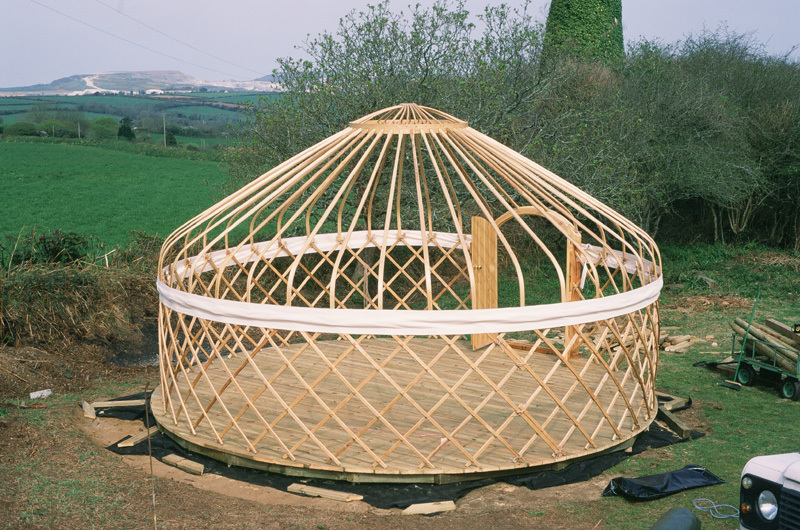 The best part about a yurt is they are fairly easy to assemble, and they can be built in a few days. And unlike a new home, yurts start at $4000. Many people will substitue a yurt for a home simply because of it’s ease, and low cost; and in Pricilla’s case, portability. So, despite ignoring Priscilla, (she doesn’t take being ignored lightly!) and procrastinating through two seasons worth of carrot harvest, I did promise to help her out with her yurt. Unfortunatley, I too am a CEO, (of something really important I just can’t think of what that is at the moment,) and she has probably given up on the idea of me offering up solutions. But that is what you get when you negotiate design services with a log pile, a seasons worth of hay and a goat named Abigail. You almost had me with the log pile, Priscilla, but Abby is where I draw the line!